Three girls are kidnapped by a man whose mind has fractured into several distinct personalities in M. Night Shyamalan’s Split. M. Night Shyamalan has become something of a joke in recent years with a string of films that are widely considered bad so imagine my surprise when this turned out to be legitimately watchable. Saying it’s the best film Shyamalan’s made in years sounds like the start of a backhanded compliment but I mean it in the most complimentary sense as he has reminded me why I loved some of his earlier work like The Sixth Sense and Unbreakable. The premise here is a fairly simple one despite how complex it might see. 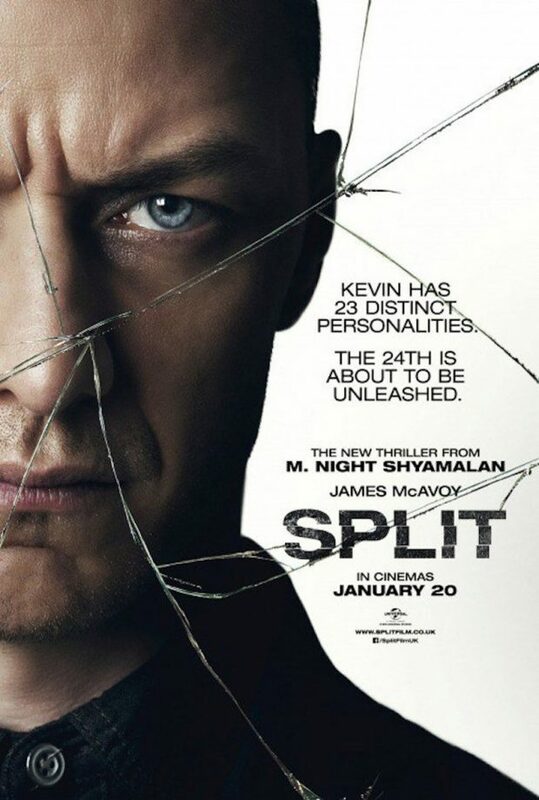 James McAvoy plays a man who has multiple personalities inside the one body which means that he gets to play a number of different characters throughout the film. It’s an actors dream and McAvoy definitely has the range to pull it off. The characters he plays are distinct and varied from a tough guy with OCD to a young child and he nails every single one of them. There’s also a dance sequence that will never be forgotten. Deciding whether to play this for laughs or for terror must have been difficult but Shyamalan goes with both depending on the scene and it works really well. When scenes are played for laughs there is the undercurrent of awkwardness since you will essentially be laughing at someone with a mental illness but the context is everything in these scenes and you will be laughing at the situation rather than the person so I think it qualifies as fine from a morality standpoint. Even in the more humorous scenes there is a lot of tension that constantly builds throughout the film to a really well constructed finale that had me figuratively on the edge of my seat. McAvoy’s performance is necessary to create a lot of this and he definitely doesn’t disappoint. This could be his finest performance ever. The three kidnapped girls are a fairly mixed bag. Claire (Haley Lu Richardson) and Marcia (Jessica Sula) are badly underdeveloped to the point that it’s difficult to be invested in them. There’s the suggestion that their entitled lives have led to them deserving this treatment but it never goes any further than that and the characters disappear for a lot of the film anyway. Casey (Anya Taylor-Joy) is better developed since she is effectively the protagonist. Taylor-Joy does a great job of showing the terror as well as the competence of her character and is a good match for McAvoy throughout. There are recurring flashbacks of her childhood that are largely unnecessary but the way Casey and McAvoy’s characters connect towards the end feels earned and appropriately shocking when the time comes. The film also boasts some deeper intrigue brought by Dr. Karen Fletcher (Betty Buckley) who serves as therapist to McAvoy’s various personalities while also being an expert in the field of multiple personalities. Her main function is to put the idea that the mind is powerful enough to make physical changes if the belief is strong enough into the viewer’s head. You can use your own judgement to figure out if the film will prove her right or not. It’s an interesting line of thought to go down and the character is around just enough to keep the idea strong in the context of the narrative. As I’ve mentioned there’s a lot of tension in this film and there’s also a lot of mystery to it. The two concepts go hand in hand in this case and there are some genuinely terrifying with lots of dark confined rooms and hallways with a constant threat looming over them to keep the urgency to a high level. Shyamalan plays to his strengths throughout this and it’s definitely the better for it. Many of you will be wondering if there is a Shyamalan trademark twist in this film and I’m not going to say whether there is or not. This is a film that really deserves to be seen rather than written about so I’ve been very careful not to spoil it. If you’ve been holding out for the next Shyamalan film that will impress then this should do the trick. A tense and terrifying experience with a powerhouse performance from James McAvoy. He completely nails the diverse and distinct personalities throughout while constantly creating terror in the way he behaves. The kidnapped girls are a mixed bag except from Cassie who is a solid match for the various McAvoy characters and connects to him in a really interesting way when it happens. Shyamalan has had a rough track record lately with some less than stellar outings but this definitely counts as a return to form.